Here’s BKLYNER’s updated list for spooky Halloween fun across the borough. Happy Halloween! PROSPECT HEIGHTS – The NYPD’s Haunted House returns from Friday, October 26 through Tuesday, October 30 (4pm to 9pm). Bring the whole family to this free house of horrors. Check out photos from last year here. 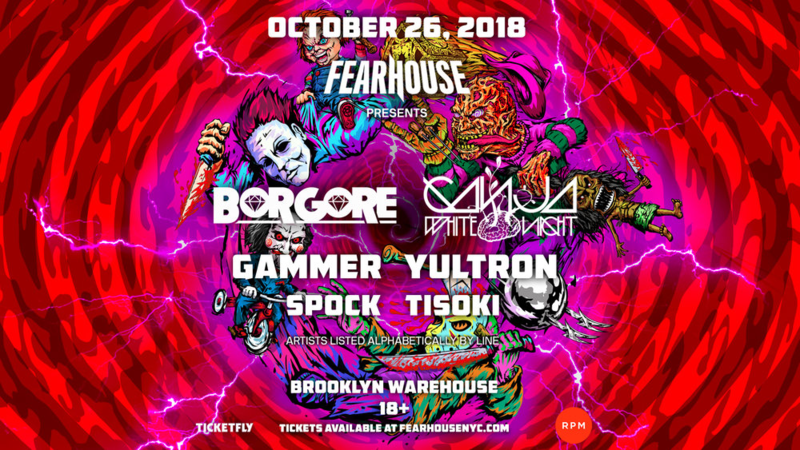 SUNSET PARK – The first can’t miss Fearhouse NYC event will take place on Friday, October 26th at 9pm at The Brooklyn Hangar with Borgore, Ganja White Night, Gammer, Yultron, Spock, and Tisoki in Brooklyn. Borgore, an Israeli EDM producer, DJ, singer-songwriter and rapper will co-headline this show with Belgian bass duo Ganja White Night, who continue to make waves in the electronic community with their iconic Wobble sound. Borgore and Ganja White Night will take the stage after sets by UK based DJ, Gammer, Los Angeles–born, Vegas–satelliting emcee, remixer, rapper, producer, and DJ Yultron, dubstep/EDM producer and DJ from Fresno, California Spock and young UK producer Tisoki. Entry to the event is 18+ and tickets can be purchased here. 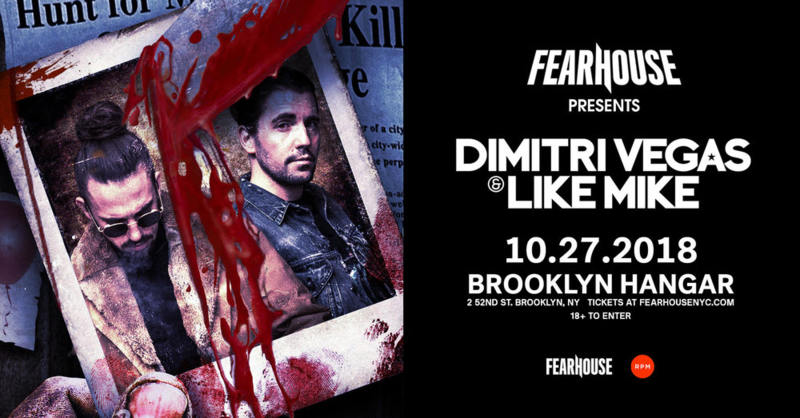 The second show with Dimitri Vegas and Like Mike will be on Saturday, October 27th. The Belgian DJ and record producer duo, composed of brothers Dimitri Thivaios and Michael Thivaios were ranked No. 1 in 2015 and are ranked No. 2 in DJ Mag’s 2014, 2016 and 2017 Top 100 DJ list. They released ‘Melody’ in 2016 with Steve Aoki & Ummet Ozcan which topped No.1 at Beatport Charts and became the official UEFA 2016 anthem of the Belgian National Football Team. Doors open at 9pm. General admission tickets begin at $65 and can be purchased here. 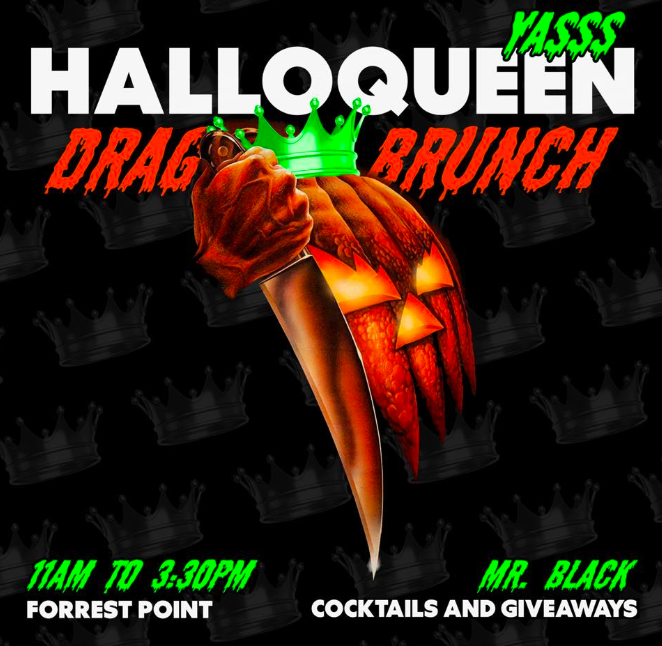 BUSHWICK – Forrest Point (970 Flushing Avenue) is hosting a Halloqueen Drag Brunch on Saturday, October 27 from 11am to 3:30pm. It should be a scream! 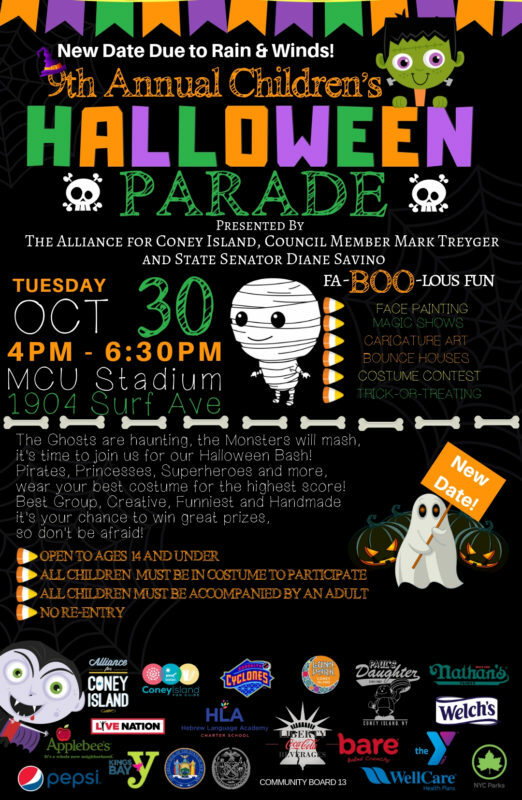 CONEY ISLAND – Children’s Halloween Parade, RESCHEDULED TO TUESDAY, OCTOBER 30, 4pm-6:30pm, the Alliance for Coney Island will host this free family-friendly event inside MCU Stadium where guests can enjoy a day of games, magic shows, bounce houses, face painting, caricature art, trick-or-treating and more. The official Coney Island Costume Contest will include categories of Most Creative, Funniest, Best Handmade, Best Group and Best Overall Costumes. The first 1,500 children will also receive a trick-or-treat bag full of goodies and a 2-hr wristband to Luna Park. The event is open to all children 14 years of age and younger in costume accompanied by an adult. GREENPOINT – Children’s Halloween Parade & Party – Sunday, October 28, 12 noon- 6pm. Parade assembles at 176 Java Street, 12:30 PM Parade kicks off & marches down Manhattan Avenue, 1-3 PM Spooktacular Party to follow for younger kids (176 Java St) 4-6 PM Zombie Nerf War for older kids (176 Java St) Proceeds benefit Town Square, local Brooklyn Boy Scout Troop 26 and local Brooklyn Pack 7. Troop 26 meets on Thursday nights at I.S. 318 in East Williamsburg; Pack 7 meets on Friday nights at St. John’s Lutheran Church in Greenpoint. FORT GREENE – 20th Great PUPkin Fort Greene Dog Costume Contest – RESCHEDULED TO SUNDAY, 10/28 from 11:30 am – 1 pm. Sold out to participate but it is a fabulous spectator event. More here. FORT GREENE – 18th Annual Fort Greene Park Halloween Fest– RESCHEDULED TO SUNDAY, 10/28 from 12 noon – 3 pm. They need help running the event, so please pitch in. Details at link. PROSPECT PARK – Prospect Park Halloween Haunted Walk + Fair – 10/27 from 12 noon – 3 pm. Free. BROOKLYN HEIGHTS – Family Friendly Haunted Brooklyn Heights (90 minutes, Ages 8+). “Take a stroll among the graceful old homes of one of Brooklyn’s oldest neighborhoods… but don’t let their sedate charms fool you. Nestled within these dwellings are a wealth of gory, ghastly, haunted, and horrific tales. Let Boroughs of the Dead guide you to the frightening sites of dreadful stories that inspire terror in those who pass them after dark.” Check times here. BROOKLYN NAVY YARD – 733 Arts Collective Halloween Fundraising Event – check out our write-up here. Saturday, October 27th 1pm-4pm. 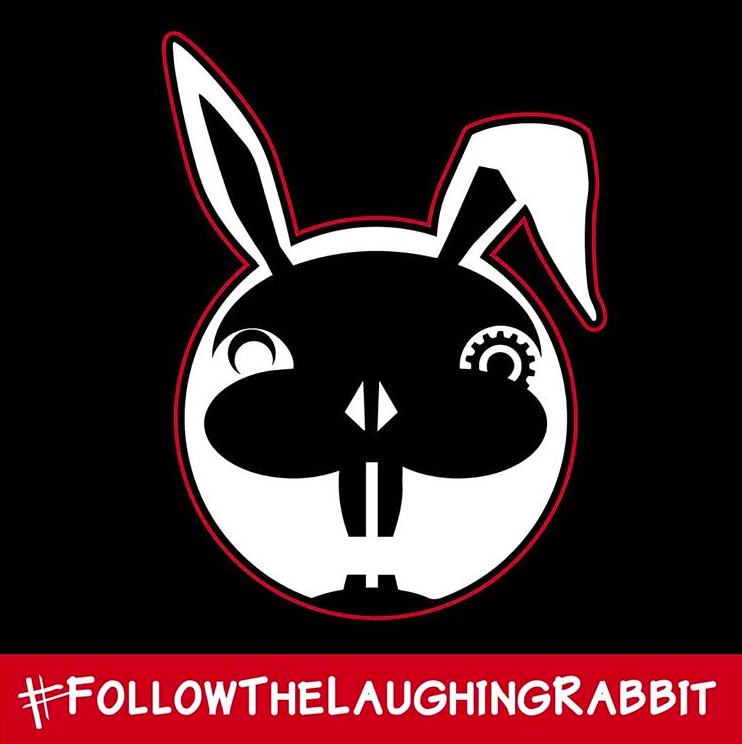 Part one, “Making Mischief,” is a free family-friendly daytime event for all ages with trick-or-treating and Halloween-themed activities. 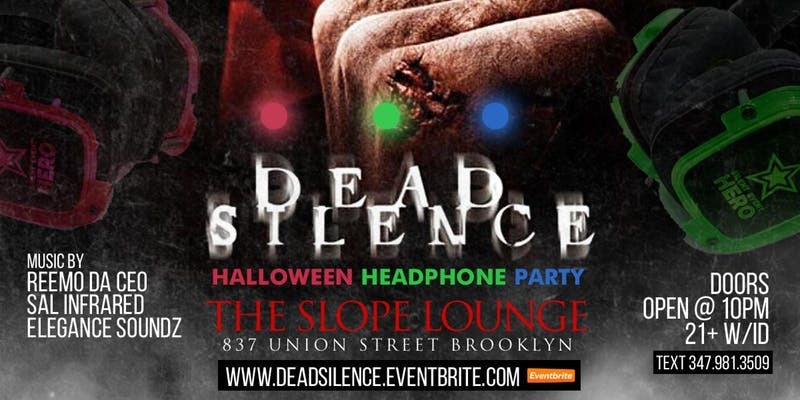 PARK SLOPE – Oct. 27, 10pm Dead Silence Halloween Headphone Party, The Slope Lounge. Yes, it’s a silent headphone party! 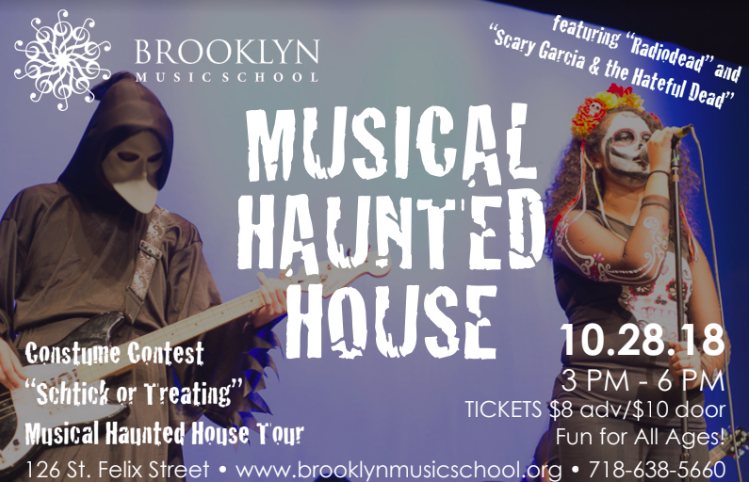 FORT GREENE – Brooklyn Music School Haunted House, Sunday, October 28, 3pm-6pm. Admission is $10 at the door, $8 if purchased in advance. Note: the haunted house typically sells out. Tickets are available online at the Brooklyn Music School website. 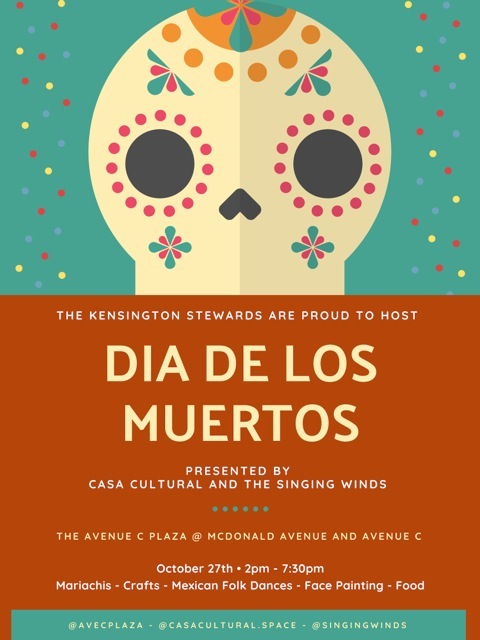 KENSINGTON – Celebrate life and honor your ancestors at the 3rd annual Avenue C Plaza Mexican Day of the Dead celebration on Saturday, Oct. 27, 2pm to 7:30pm. The entire block from Church to Avenue C along McDonald will be closed and filled with fun activities including craft-making from 2pm to 3:30pm, a performance by Mexican circus troupe Circo Ollin at 4:30pm, free tamales and pan de Muerto, Folklorico troupes, and a parade with performers and local students. The Lighting of the Ofrenda accompanied by the woman-led Mariachi Fiesta Mexicana will take place at 7pm. 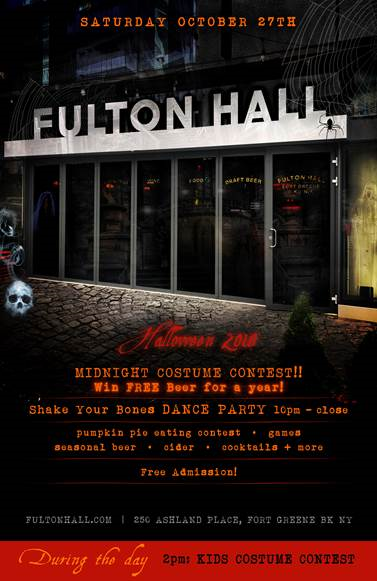 FORT GREENE – Fulton Hall (250 Ashland Place), at Gotham Market at the Ashland, is hosting an all-day Halloween event on Saturday, October 27 featuring a dance party, pumpkin pie eating contest, games, seasonal beer, cider, and cocktails. The kids costume contest takes place at 2:00pm. Winners of the midnight costume contest will win free beer for a year! SUNSET PARK – Industry City has lots of Halloween fun planned for kids and adults on Saturday, Sunday, and Wednesday. Check out their events schedule at industrycity.com. COBBLE HILL – Cobble Hill Park Halloween Parade starts at 4pm. 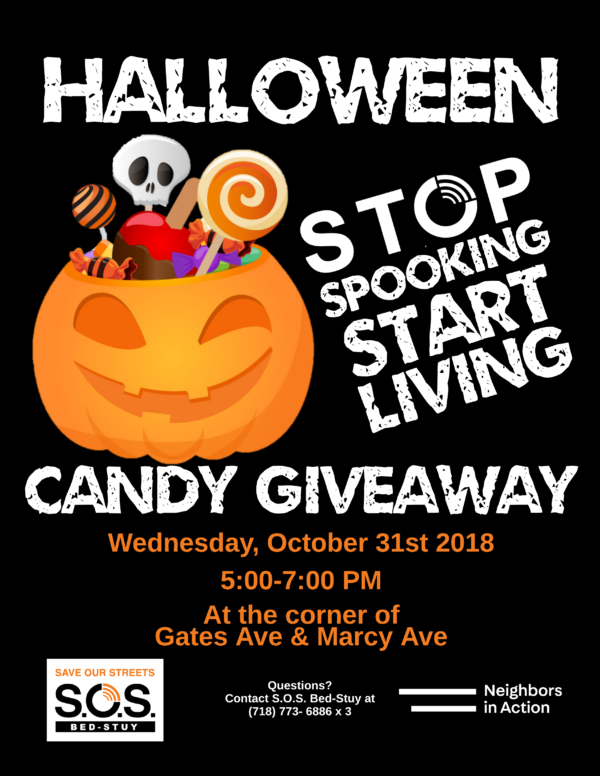 BED-STUY – Stop Spooking, Start Living, October 31, 5 pm – 7 pm. See flyer above. DITMAS PARK – Prospect Park South Halloween Parade – 5:30 pm, starts at the corner of Albemarle and Argyle Roads. MIDWOOD – West Midwood Halloween Parade- October 31 at 6:30 pm. Meet at the dead end on Glenwood Road near Rugby Road. BENSONHURST – Assemblyman Colton’s (D – Gravesend, Bensonhurst, Bath Beach, and Dyker Heights) office will be open for Trick or Treat from 2:45 pm to 5:30 pm on Wednesday, October 31, 2018, at 155 Kings Highway, Brooklyn, NY 11223 (between West 12th and West 13th Streets). 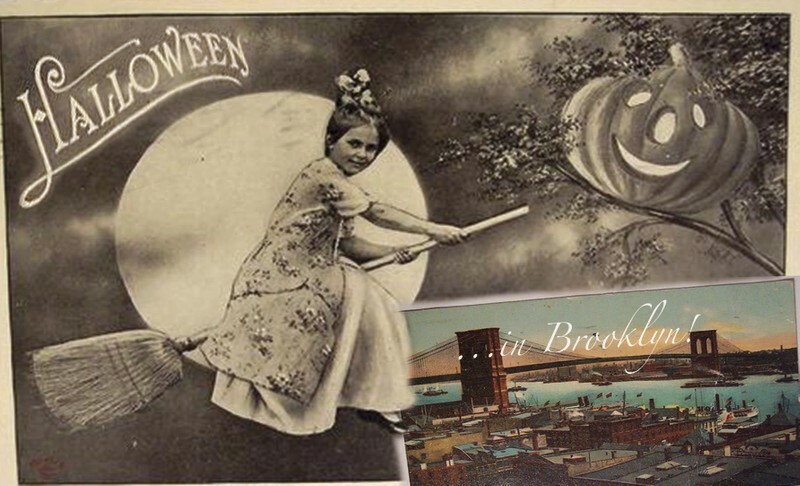 BROOKLYN HEIGHTS – And finally, Brooklyn Historical Society will host Boos in the Borough: A Brooklyn Historical Halloween on Wednesday, October 31, 6pm to 9pm. Join them for tales of Brooklyn’s ghosts featuring Boroughs of the Dead, an exploration of funerary traditions with a funeral director, and more celebrations of the macabre. Wear a costume and compete for the title of Best Dressed Ghoul in Brooklyn! 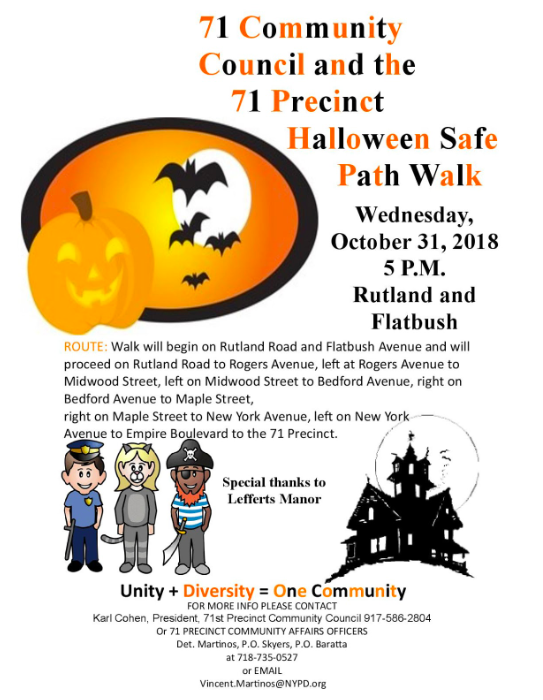 The Halloween show that was staged on Clinton Ave for the past 24 years and has relocated to Bedford Stuyvesant at the Macon Library, Macon and Lewis Ave from 6-8. I think that’s worth mentioning.